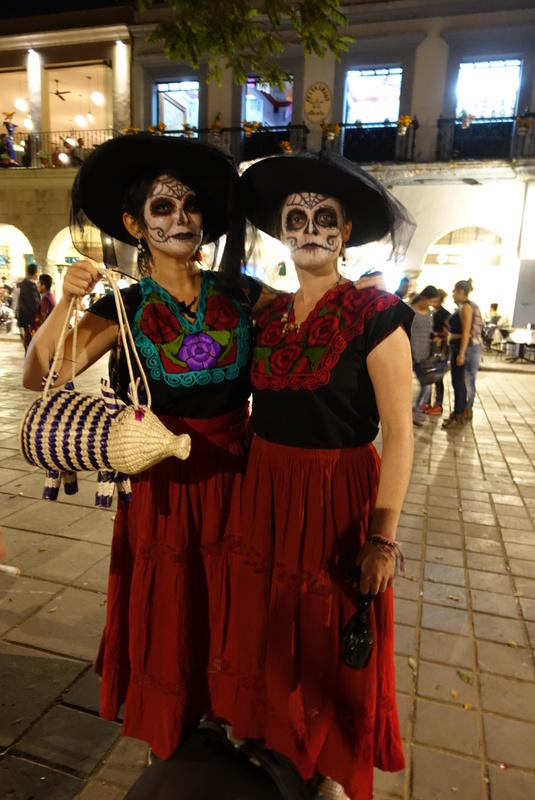 Day of the Dead is a celebration to remember friends and family that have died. 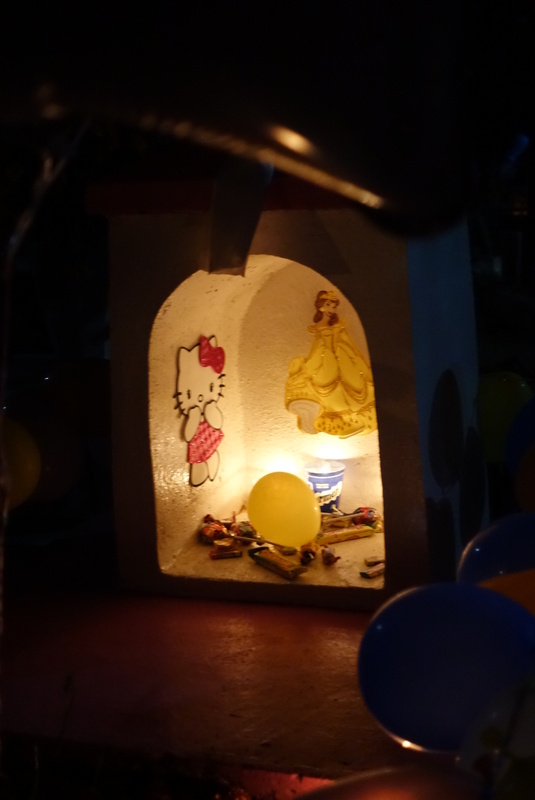 November 1st is All Saints Day and ‘Dia de Los Inocentes’ which is to honour dead children and babies. November 2nd is ‘Dia de Los Muertos’ to honour all the dead and is known as ‘All Souls Day.’ It is believed that the ‘veil’ between the Spirit world and our dimension is thinner at this time of year and the souls of the dead come back to visit those that are still alive. 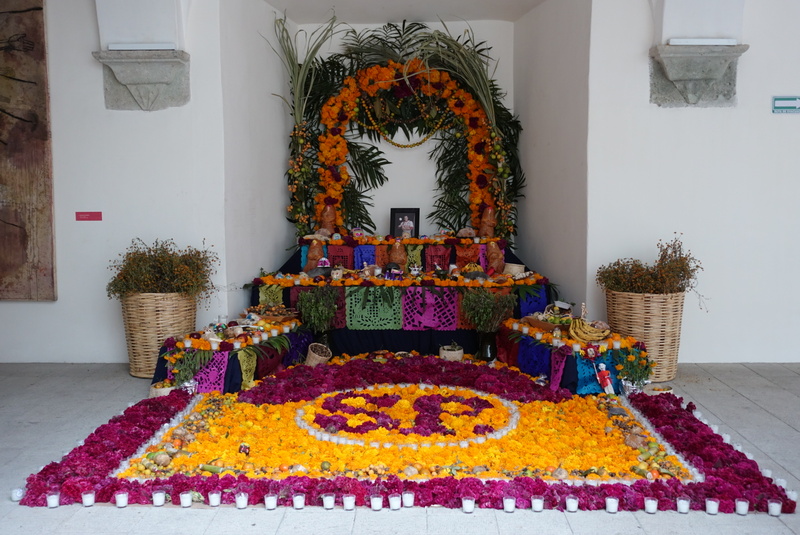 Altars, (‘Ofrenda’s) are made with food, bread, tamales, mescal, tequila, the offerings vary depending on the region and the taste of the deceased soul. They are decorated with a variety of flowers, most notably Cempasuchil and Tericopelo Rojo. Cempasuchil, an orange flower also known as ‘Marigolds’ are bright orange and strong aroma is thought to attract the Spirits and make them feel welcome. Accompanying the Tericopelo Rojo is a red coral looking flower that represents the blood of Christ. I also noticed a lot of Gladiolas which are typical sympathy flowers used in our culture. The flowers are a representation that life is temporary. You see the mix of pagan rituals dating back to Aztec times and the introduction of Christianity. 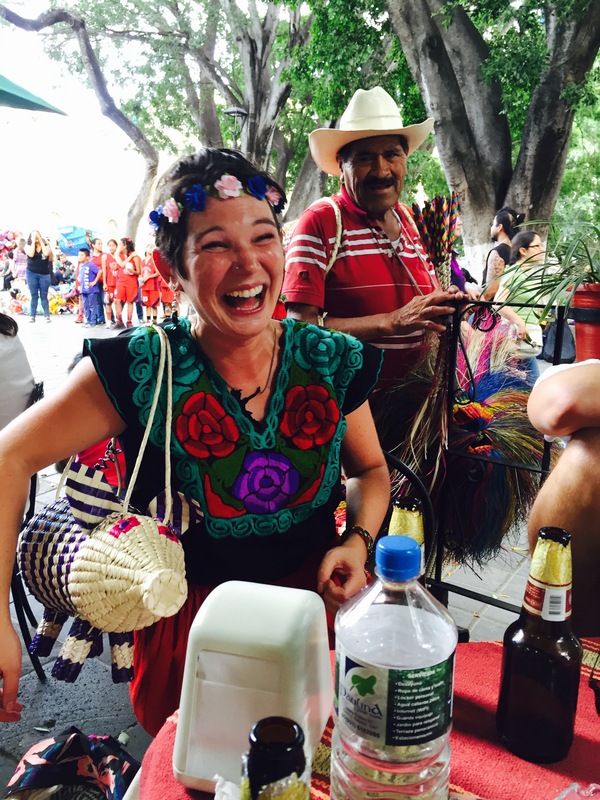 I like the fact that the Mexicans have adopted different traditions and beliefs and mixed them together to formulate their own special ritual. Family and friends gather in cemeteries and create a party like atmosphere with food, drink and music. It is an opportunity to commune and remember those that are no longer with them. 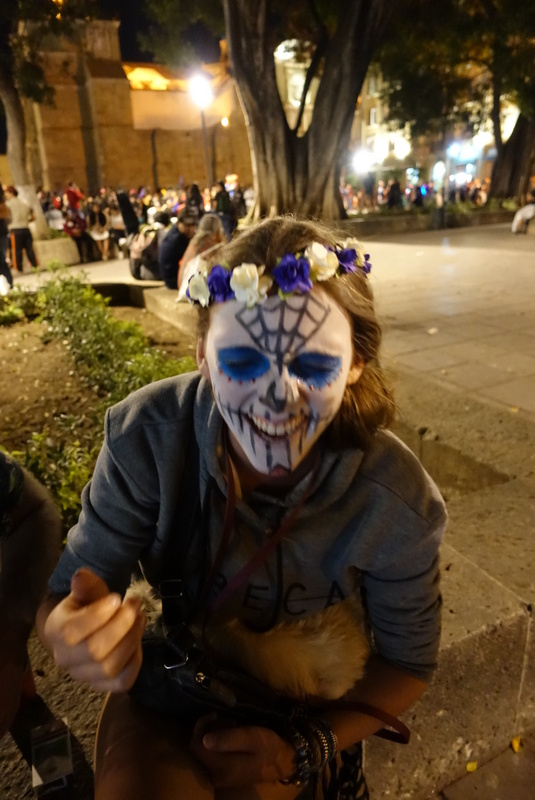 Many street vendors and selling skeleton memorabilia and street artists are everywhere to paint faces. 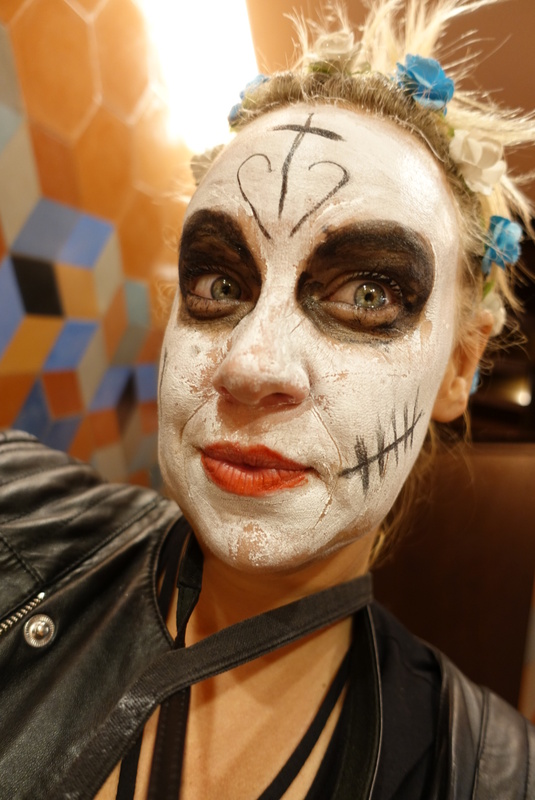 Annoyingly I chose a total amateur to paint my face, hence I ended up looking more like the Joker…NO JOKE! 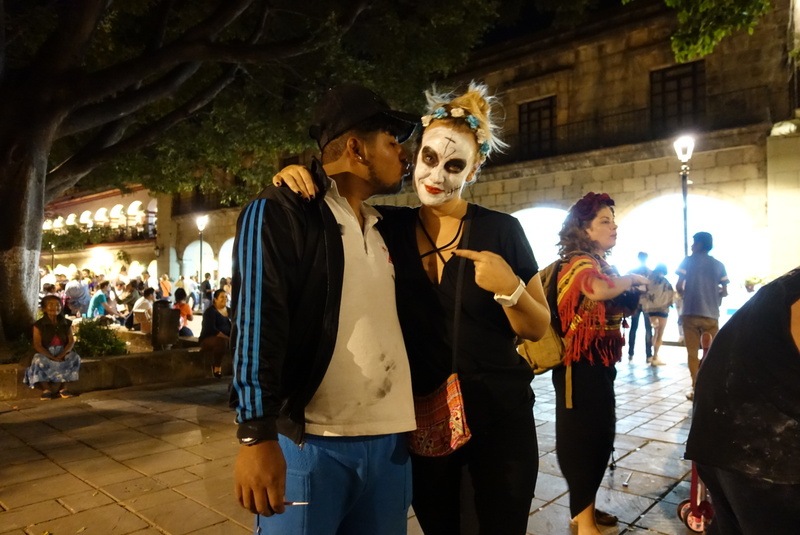 This is the joker who painted my face…It definitely made everyone laugh a lot, so thats good! Nan was persuaded to buy this basket pig handbag earlier in the day. How’s travelling around with that going Nan? Someone mentioned to me that she felt it was strange that people joked and laughed about their dead relatives. I personally connect with this. Often my sisters and I laugh at what our Mum may find uncomfortable or frustrating about our lives today. Sometimes I have questioned that my sisters and I should mourn more with one another and if humour and discussing the practicalities of life have shielded us from the vulnerability our hearts to avoid the pain of sadness that lays within us. I accept more than ever that our process of dealing with our grief and our circumstance is totally fine, I no longer judge how it should or shouldn’t’ be. I feel extremely fortunate that my sisters and I are able to talk to one another about everything and we know we were loved and cared for by our parents and that we still are. I truly believe that I have them as angels around me, guiding me and watching me every day. Do I ever visit my parent’s graveyards? No, never. The years following my Father’s death we used to visit his plaque regularly that is in a Church yard close to where my Grandmother used to live in Sonning-on-Thames near Reading. My Father was cremated and his ashes were buried there. I always found it difficult to experience my emotions whilst surrounded by the rest of my family. My Mother died 14 years ago and I have been to her grave once when we went to sprinkle the ashes of our beloved dog Percy next to her. I don’t feel guilty about not attending their graves. I know their Spirit is with me every day and I can connect and talk to them wherever I am. I love the idea of bringing Day of the Dead to our Western Calendar as an opportunity to stop and remember those that have gone before us. For us to slow down and think about our own mortality and embrace death as part of life so that we can live each day more fully. Remembering the dead doesn’t always have to be mournful or sad, but it seems in our culture we prefer not to think about it at all. I believe that the more we integrate those that are dead into our lives, it makes our grief easier to cope with.